"Rhubarb makes a great addition to a springtime salsa that's so nice with chicken, fish, on a taco, or just scooped up in a tortilla chip." Bring a pot of water to a boil over medium heat, and stir in the rhubarb; simmer for 2 minutes to blanch. Drain in a colander set in the sink, and let cool. 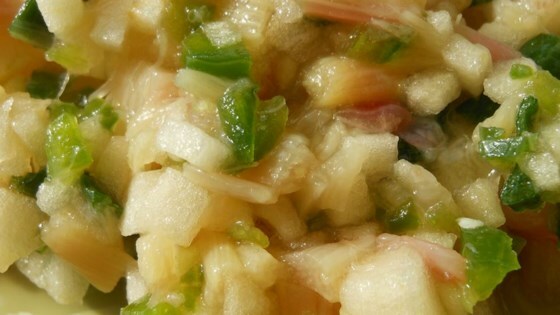 Stir together the cooled rhubarb, apple, green onions, lime juice, honey, and jalapeno pepper until thoroughly combined. Although I enjoyed this somewhat, I didn't enjoy it as much as other reviewers. I will not be making again. I made this for my friends to go with grilled chicken and we all loved it! I would definately recommend this to someone who wants to use rhubarb in their cooking more! Love this! Great for summer picnics and get-togethers. Served with jalapeno lime tortilla chips which gave an extra kick! I really liked this recipe and basically ate it all myself, because nobody else at the picnic would eat it. Oh well, more for me! I have a farm share and used fresh from the farm everything! It was a huge hit with all - even the kids!